Peter on Pilot Training Reform Symposium - What Would You Change? JetAviator7 on Pilot Training Reform Symposium - What Would You Change? Brianlogilvie on Pilot Training Reform Symposium - What Would You Change? Pete Grass on Pilot Training Reform Symposium - What Would You Change? Flight simulators can improve flying skills, especially if they closely approximate a real airplane. But many don’t, so when I teach clients in those devices I frequently say “In the real airplane it works differently from this.” But finally there’s a device that so closely mirrors the real Garmin G1000 that I don’t need to make excuses for it. It’s the new GT Glass Trainer from Precision Flight Controls (PFC). Technically, most devices found in flight schools are not flight simulators. The FAA reserves that term for the million dollar devices used to train pilots in turboprops and jets. 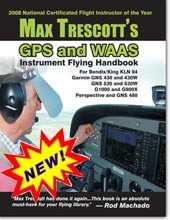 Most systems found in flight schools are AATDs, or Advanced Aviation Training Devices. The GT Glass Trainer is an AATD. In 2004, Garmin introduced the G1000 glass cockpit and by 2006, the first G1000 AATDs began to appear. Many of these resembled real aircraft, such as a Cessna 172 or 182. But the resemblance was only skin deep: while the hardware was sometimes identical, the software never was. Since Garmin didn’t make their software available, device manufacturers had to recreate every line of code from scratch to emulate G1000 functionality. While they got the basics right, G1000 instrument procedures and some Multifunction Display (MFD) screens were poorly emulated. Enter the GT Glass Trainer. It is low cost compared to other G1000 AATDs, about $25,000, and I estimate it replicates the G1000 with 99.8% accuracy, vastly better than other devices I’ve seen. I’ll discuss why it’s so accurate in a moment. Physically, the system consists of a Cirrus II Flight Console with an integrated yoke, realistic looking G1000 Primary Flight Display (PFD) and MFD displays, and one or more flat screen displays to show the view outside the airplane. Two computers, one Windows and one Linux, rudder pedals, and a flight instructor station complete the system. Accurate G1000 depictions for about a dozen aircraft, ranging from a Cessna 172 to a Cirrus Perspective SR20, can be selected for display on the PFD and MFD. The G1000 displays simulate all of the latest features and the database can be easily updated so that you’re flying with current airport and instrument approach data. System start up takes about two minutes using an easy to follow, illustrated checklist. Following startup, an airplane appears at the beginning of a local runway, which can easily be changed from the instructor console. Start the engine, release the brakes, and off you go! The flight dynamics and the flight instructor console are driven by the popular X-Plane program, which runs on the Linux computer. It lets you quickly position an aircraft at the end of any runway. You can also pre-position an aircraft on a 3 or 10 NM final to any runway, which is a fast way to get set up for an instrument approach. Of course the aircraft can also be dragged to any position on the map. The console also lets a flight instructor control the weather in exquisite detail and simulate the failure of dozens of aircraft and G1000 components. The system includes a replica of the G1000 audio panel and the keys used to control the integrated Garmin GFC700 autopilot. The KAP 140 autopilot, found in pre-2007 G1000 aircraft, is not simulated. The secret to the high fidelity of the GT Glass Trainer is that it uses the G1000 PC Trainer software from Garmin to drive the displays. This saved PFC from having to reinvent every line of G1000 code. But it created a technical challenge. Since Garmin’s PC Trainer, which runs on a Windows desktop with a Nvidia graphics card, is driven by user mouse clicks, PFC needed to translate the knob turning and button pushing on their displays to the mouse clicks the PC Trainer software needs. Their solution works well, though occasionally a click gets dropped as a knob on the PFD or MFD is turned. Turning the knob an extra click solves the problem. Synthetic Vision (SVT), available as an option in 2007 and later version G1000 aircraft, is included and it provides a pseuo-3D depiction of terrain and obstacles up to 15 miles in front of the aircraft. In real aircraft, the SVT depiction of the runway centerline is so accurate it’s usually no more than a couple of feet left or right of the actual centerline. One thing I’ve learned from teaching in the GT Glass Trainer is that if the outside weather is set for zero visibility, pilots can still successfully land the simulator on a runway using only the PFD’s synthetic vision! That’s a handy piece of knowledge to have if someday your only option is to land in near zero visibility. 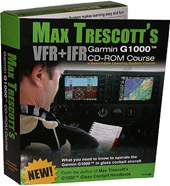 Other advanced G1000 features like TAWS (terrain warning), IFR approach charts, and SAFETAXI diagrams are included. I found only a few minor discrepancies between the GT Glass Trainer and the actual G1000 and a couple of these have already been corrected. One that remains is that the VNV (vertical navigation) key on the autopilot cannot be armed in combination with the APR (approach mode) key. That’s because the Garmin PC Trainer software only permits one vertical autopilot mode at a time. Given that there may be at least two thousand G1000 keystroke combinations, having only three or four minor discrepancies means it’s 99.8% accurate, which is excellent. 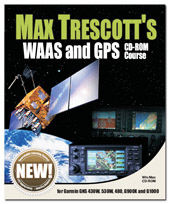 Typically flight schools use AATD’s mostly for instrument training, since up to 20 of the required 40 hours can be logged in these devices. But the fidelity of these devices, which is how closely they resemble a real airplane, was often poor, making the simulator time of questionable value. 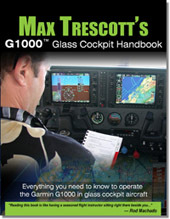 But the new GT Glass Trainer so closely represents the real G1000 that knowledge gained training in it should directly transfer to flying a G1000 or Perspective airplane. So don’t hesitate to start training for the instrument rating in this AATD. Perspective Glass Cockpit Handbook. What’s become clear to me is that unless a pilot flies a couple of times a month in a G1000 plane, he or she will benefit from some self-study between flights. Otherwise button-pushing skills degrade and pilots fall back to using the Direct-to key, the most rudimentary way to program the G1000’s GPS. Self-study can take many forms. It can be reviewing a book between flights (and yes I can recommend a good one). It can be running Garmin’s PC Trainer software on your Windows PC at home (though it only works if you have a Nvidia graphics card installed in your desktop). Or it can be done in an AATD like the GT Glass Trainer. If you’re not flying frequently, supplement your flight time with time in the AATD. Pilots transitioning into a G1000 airplane will also find the AATD a cost-effective way to begin the transition. That’s because flying a new aircraft type increases a pilot’s workload, reducing his or her capacity to absorb new information. By contrast, it’s easy to pause the GT Glass Trainer at any point and have an in-depth conversation about a feature or issue. As I watch pilots in the AATD, I can tell they are more relaxed and better able to listen and comprehend versus when they’re in an airplane. Private training is a huge untapped opportunity for the use of AATDs like the GT Glass Trainer. Currently the FAA allows up to 2.5 hours of the required 40 hours of Private training to be conducted in an AATD. In my opinion, this number should be increased in the future, but in the meantime, AATD training time is valuable for student pilots getting their Private in a G1000 aircraft. Besides learning the intricacies of the G1000, it lets them practice and memorize the steps needed to perform many of the maneuvers required for the Private checkride. You can detailed pricing information from PFC by by clicking on Request a Quote. Or, if you'd like to do some training in the GT Trainer with me at Palo Alto or San Carlos, CA, contact me. Photos taken at EAA Airventure 2008 in Oshkosh, Wisconsin. This truly the World's Greatest Aviation Celebration. It always exceeds expectations, so if you've never been there, start planning for next year now! Photos taken at EAA Airventure 2007 in Oshkosh, Wisconsin. There's no way to adequately describe how wonderful Oshkosh is merely by seeing pictures and reading about it. Oshkosh is Mecca for pilots, and you owe it to yourself to get there at least once in your life and spend several days.